It might not be apparent to you all just yet (unless you've checked out my Etsy shop), but I LOVE to crochet food! It is my favorite thing to hook up! I especially love to turn crochet food into hair accessories and pins. I have made a lot of fun pieces that are food inspired, but donuts hadn't made it to my hook until recently. I am so happy that they did because this pattern was really fun to design! These donuts measure about 2 inches in diameter, which makes them super versatile. I made hair clips and a headband out of mine. You can sew them onto a hat, make a donut pin, and you could even make a bookmark or planner clips out of them. There is nothing these little donuts cannot do (except satisfy the donut cravings you'll get while making them)! They are also great stash busters as they require very little yarn to make them. So, break out all those little balls in your stash and put them to use! I designed two types of donuts- with holes and without. 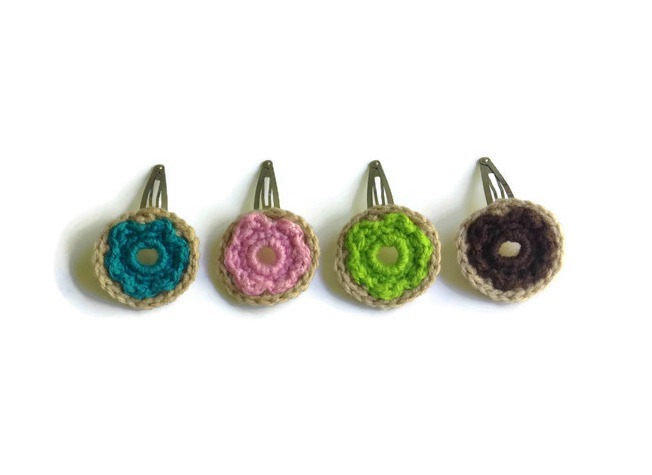 Today I will share the donuts with holes, and I'll post the pattern for donuts without holes tomorrow. I used many different yarns for the icings, but for the light brown donut part of each donut I used Red Heart Super Saver in Buff. R3- (Front loop only) Chain 1. 4 SC in same stitch as joining. Skip next stitch. Slip stitch in next. 3 SC in next. Skip next stitch. Slip stitch in next. *4 SC in next. Skip next stitch. Slip Stitch in next. 3 SC in next. Skip next stitch. Slip stitch in next. * Repeat from *to * around. Finish off leaving a long tail to sew the icing down the donut portion after round 4. Sew your icing down onto the donut portion (Unless you like the way it looks already. ), weave in ends, and there you have it! 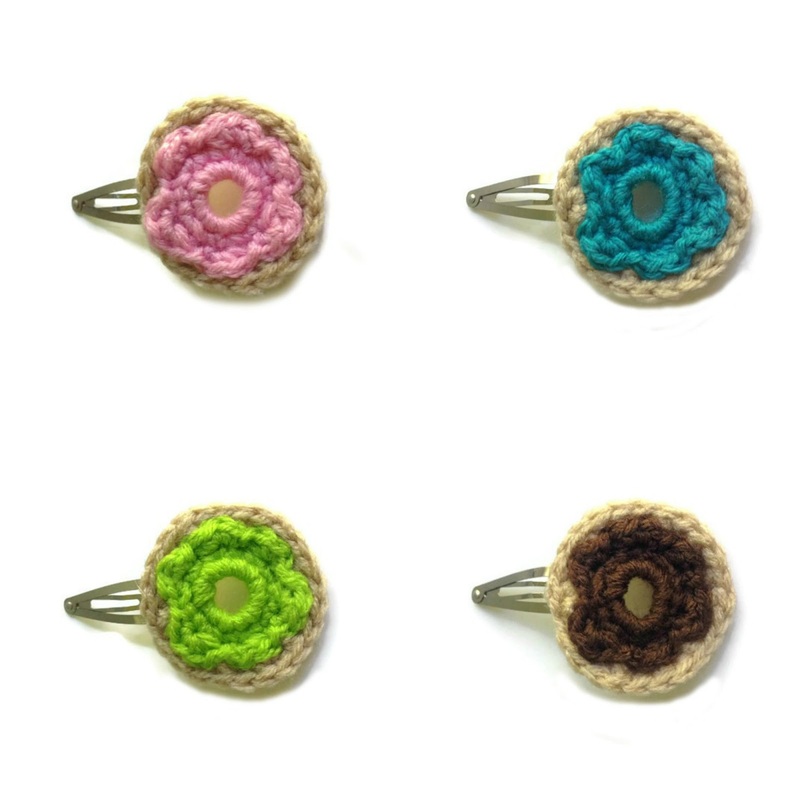 Tune in tomorrow for the donut without holes pattern!